Batting down rumors of an impending sale, Tribune Publishing says it is "not engaged in discussions or a process to sell the company." Tribune made the statement in an email to employees on Monday morning. "Tribune Publishing remains committed to its strategy and transformation plan," the email added. It was meant to reassure anxious staffers at newspapers like The Los Angeles Times and The Chicago Tribune, several days after Rupert Murdoch tweeted what he was hearing about a sale. He wrote that there was "strong word" that Tribune Publishing is going "to be bought by big Wall St firm." The L.A. Times will "go to philanthropist Eli Broad and local group," Murdoch said. Murdoch's comment matched industry speculation about a pending transaction involving Tribune. Indeed, according to the noted industry analyst Ken Doctor, the private equity firm Apollo Global Management "first approached Tribune Publishing about a month ago, telling board chair Eddy Hartenstein of its interest in buying the company." But "after receiving that expression, Tribune Publishing has been 'non-responsive,' unwilling to schedule meetings or provide deeper-than-public financials," Doctor reported over the weekend. This jives with Tribune's assertion on Monday that it is "not engaged in discussions." 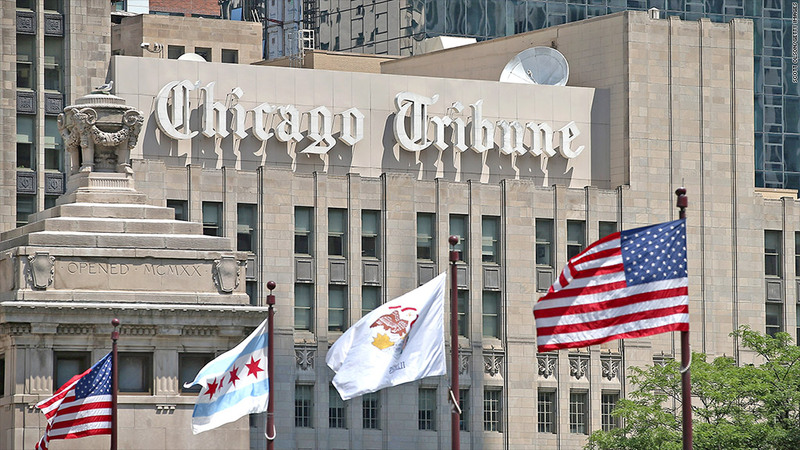 While a potential buyer is circling the beleaguered business, Tribune is not answering the calls. Something similar happened earlier this year. Broad, the billionaire philanthropist who Murdoch mentioned in his tweet, put out feelers about buying the Times over the summer, but he was rebuffed. But Broad is still in the mix. Doctor reported that Apollo has had recent discussions with Broad about a two-part deal. First Apollo would buy all of Tribune, then Apollo would sell the California papers to Broad and a group of other local investors. At that point Austin Beutner, who is supportive of a breakup and was fired by Tribune in September, could be restored as the publisher of the California papers. Broad and Beutner declined to comment after Murdoch tweeted the rumor last week.